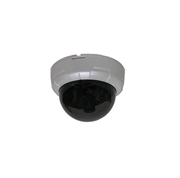 High resolution outdoor vandal resistant color dome camera with varifocal lens. Designed for hybrid surveillance networks that have IP megapixel high definition CCTV cameras and traditional analog cameras, Nubix HDX hybrid DVRs work well with both types of cameras. Pentaplex operation lets you work smoothly throughout the day no matter what security tasks you need to perform, even if you are doing the tasks remotely. It's no secret our DVRs have a cozy relationship with the PC platform. We're proud to add MAC operating system compatibility with our HD & HDX series. No longer will MAC users be stuck with inferior quality DVRs from other manufacturers. An imbedded Linux operating system with a graphical user interface lies at the heart of this DVR. This makes programming and setup menus easy to navigate. It's a snap to set up event-triggered functions like having the DVR email you if it detects unauthorized activity. If the multilingual GUI (graphical user interface) ever needs an update you can download it for free from our support site. Put it on a USB flash drive (supplied with the DVR) and then follow the menu driven instructions to upgrade your DVR. Power adapter, manual, and setup materials included.